I remember as a kid whenever my friends or I would ask for Pokemon games, cards, VHS tapes and toys, our parents would tell us that Pokemon was just a fad and that we’d be over it in less than a year. 17 years of countless anime episodes, video games and movies, it’s more of a worldwide cultural phenomenon than ever before. Although I had always been more interested in the Pokemon canon video games as a kid (and now), the Indigo League Pokemon anime series was what first introduced me to the franchise that I still adore. 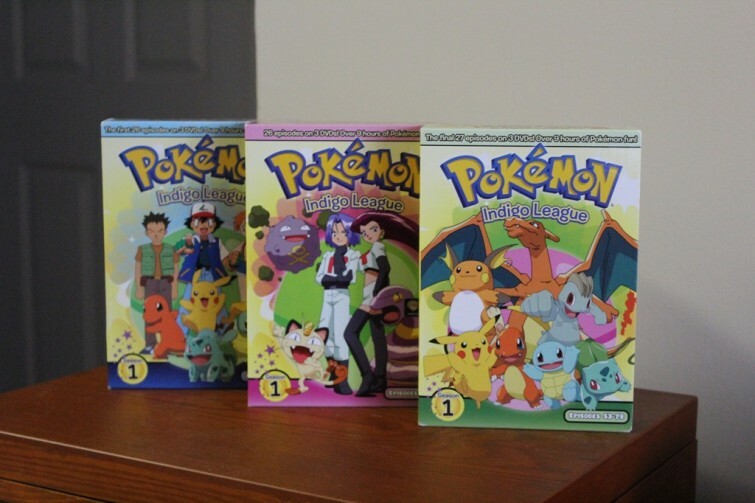 I purchased the Indigo League series on DVD in three separate volumes (pictured above) about a year ago. But last week, Viz Media released the complete set in a more convenient and more affordable complete box set. You can order The Complete Indigo League DVD box set, which includes 79 episodes on 9 discs, right here on Amazon. I remember as a kid, my favorite pass time was watching the show while I played along with the games on Game Boy. I’d wake up early to watch it every morning and make sure I set aside time to catch the new episodes on Saturday. Everything about the show, every time Ash catches a new Pokemon or discovered a new battle technique was somehow really thrilling and addictive. The series begins with 10-year-old Ash Ketchum, who is finally able to start a new journey as a Pokémon trainer. When he oversleeps the night before he’s scheduled to received his first Pokemon, he misses out on getting one of the three Kanto starter Pokémon: Charmander, Bulbasaur or Squirtle. However, Professor Oak has one last Pokémon at his lab, a Pikachu. Pikachu is a thoroughly disagreeable and mistrusting Pokemon that refuses to stay in its Pokeball. But when Ash saves Pikachu from a crew of evil Spearows, they become best friends. On the way Ash meets Misty, the Cerulean City water Pokemon Gym Leader, and Brock, the Pewter City Gym Leader who sets out to become the greatest Pokémon breeder. Along the way, Ash remains consistent in his mission to become the world’s greatest Pokemon trainer, meeting new Pokemon and friends along the way and learning how to grow as a trainer with each defeat. Some of the episodes are absolutely ridiculous. In episode 60 “Clefairy Tales,” the gang are victims of theft. When they investigate the string of robberies, they discover that Clefairies are stealing items in order to build a spaceship. Some episodes are ridiculous in a fun way. In episode 22 “Abra and the Psychic Showdown,” Sabrina a psychic gym leader turns Ash and his friends into toys while the sadistic child plays with them in her doll house. My personal favorite story revolves around the Squirtle Squad (from episode 12 “Here Comes The Squirtle Squad”). In the episode, Ash tries to stop a gang of mischievous Squirtles who vandalize a town. But when Ash saves the gang leader from an attack from Team Rocket, Squirtle joins Ash’s party, and the gang becomes the town’s new firefighters. Unfortunately, some parts of the series haven’t aged as well as others. For example, as a kid, the Team Rocket subplots were a lot of fun to watch. But when you’re watching the show as an adult, the same formula of the villainous trio attempting to do something evil, being defeated by the show’s heroes and then blasting off again gets super tedious. The fact that they rarely alter their approach or do much that affects anyone outside of Ash’s band of friends is disappointing, especially considering how the Team Rocket in Pokemon Red and Pokemon Blue for the original Game Boy managed to take over entire caves and industrial plants. Team Rocket in the show is more like a nuisance than a gang of criminal thugs. Similarly, the three protagonists aren’t as dynamic as they could have been. Most jokes rely on painting them as rather 2-dimensional characters. And it would have been nice to feel a little more growth from the characters in the 80 episodes that it took to bring Ash from getting his first Pokemon to competing in the Pokemon League. By the end of the series, I still felt Ash was rather amateurish in his approach to becoming a Pokemon master, as much of his success in the show involved luck. Still, the fact that the show was able to produce 80 episodes from April 1, 1997 to January 21, 1999 is impressive– even if most of the episode narrative are all about Ash training his Pokemon more diligently without becoming over-controlling. It was fun and consistent. And I remember looking eagerly looking forward to each new episode like nothing else on television. The Indigo League was a great introduction to the series’ now deep and intricate mythology. I’m as big of a fan now as I was nearly two decades ago. I still occasionally go back to watch earlier episodes while I play through the 22 canon Pokemon games in the series. And of course I already have my copy of Pokémon Alpha Sapphire and Omega Ruby on the 3DS pre-ordered. You can order The Complete Indigo League box set, which includes 79 episodes, right here on Amazon. Retail is $54.99, but Amazon will frequently offer big discounts on the series, which usually costs over $60 if purchased in separate three-part volumes. The four-part remake Pokemon Origins, which follows the video game series more closely with Ash catching every Pokemon in the Kanto region and features better graphics, is available to stream on Amazon for $1.99 per episode. And if you watch the set and want to continue the series, the next part in the Pokemon story is Adventures on the Orange Islands, which takes place between the Kanto and Johto chapters. Currently the Johto Chapter, which is broken into three parts (The Johto Journeys, Johto League Champions and Master Quest) and contains 157 episodes, currently has not been re-released on DVD. The only way to purchase it on DVD is to track down each individual volume part, some of which have become really rare. Hopefully if the Indigo League box set becomes successful, the Johto Chapter will get a complete box set release. Is it the original voice actors?﻿ The one we seen on TV? Yes it is Frank. Exactly the same as the ones originally broadcast. Yes, Frank. Same original voice actors– the same as the one seen broadcast in the states in the 90s!